The C-X75 sports car. 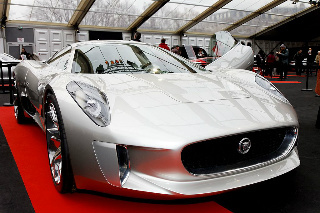 In 2010, Jaguar cars introduced the C-X75, a two seater concept car, based on hybrid-electric technology, which they intended to launch in 2013 as a limited edition model with a planned output of just 250 cars. The body styling was reminiscent of the iconic XJ13 Jaguar sports car. It was to be a supercar with propulsion centred on the principle of the gas turbine. The concept car was powered by way of four electric motors which each drove one of the wheels. Each motor was driven by a lithium-ion battery, which itself was charged by way of two miniature gas turbines that used diesel as one of the many sources of propulsion. In this way, the use of a conventional petrol or diesel engine used to charge the battery was by-passed. This four-wheel drive car was projected to have a top speed of 205 mph, and was capable of travelling for up to 70 miles solely on its electric motors which had received a six hour charge from a domestic supply. With the gas turbines activated, the car was designed to have a range of anything up to 600 miles, whilst producing only 28 grams of CO2 per km. Each electric motor had a weight of 50 kg, and was capable of producing 195 bhp, which gave a total power output of 778 bhp which, in turn, developed a combined torque of 1180 ft/lbs. An important advantage of the gas turbine system was that a range of fuels could be used, such as diesel, bio-fuels, natural gas, and LPG (liquid petroleum gas). The chassis was to be constructed of bonded aluminium, whilst the body panels would themselves be aluminium, so saving weight and improving performance. There was a carbon fibre rear diffuser, which helped to create additional down-force, and this was augmented by a rear aerofoil which would automatically be lowered as the car increased speed beyond a certain point. Consequently, it had an excellent coefficient of drag of 0.32. In 2011, Jaguar cars indicated that, in the production version, a small, modified petrol engine would replace the miniature gas turbines in the original concept car. Running on only its electric motors, each of which weighed 50 kg, the production version was forecast to have a range of 30 miles. In terms of performance, the company anticipated that the Jaguar C-X75 would produce a 0-62 mph time of 3.4 secs, with a 50 to 90 mph time of 2.3 secs. The planned selling price of the new car was between £700,000 and £900,000. 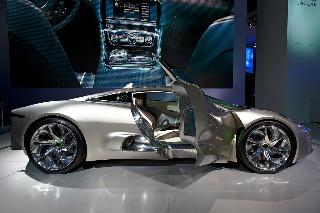 At the end of 2012, Jaguar cars announced that, as a result of the continuing global recession, production of the C-X75 was to be cancelled, although the technology associated with the model was to be applied to other Jaguar cars. Only five prototypes were ever built, with two being kept by Jaguar, and the remaining three were to be sold. 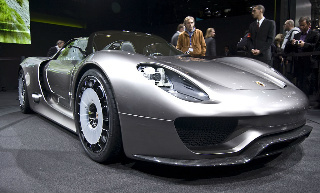 In terms of competition, one cannot forget the Porsche 918 Spyder concept. Powered by a V8 engine plus three electric motors, it developed 218 bhp, and had a top speed of 198 mph, and 0-60 mph in 3.2 secs.